When Beast first revealed himself in the castle, we were shocked. A man covered in mangy hair with a mouth full of jagged teeth sounds like something we'd see in a nightmare. But instead, it became poor Belle's reality! He was vicious, always snarling, and basically the worst person to live with, until the enchanted household objects gave him a makeover. Once Beast got a proper bath, brushed his teeth, and dressed in decent clothing, he totally transformed into a way better-looking beast. He looked like less of a nightmare and more of a dreamboat! If you want to dress as post-makeover Beast instead of pre-makeover Beast, then this is the costume for you! 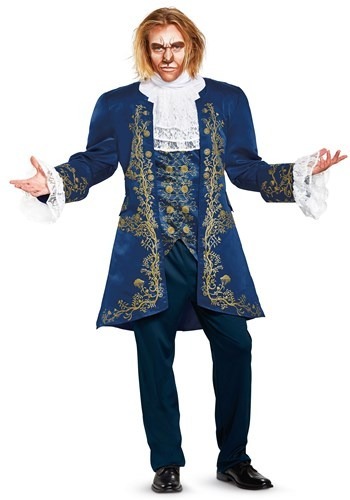 You'll look more charming than scary because this costume doesn't come with a scary mask and a furry jumpsuit; instead you'll be outfitted in a dashing royal blue suit. This Beauty and the Beast prestige costume comes with a knee-length tunic printed with gold buttons and matching designs. You'll also receive matching elastic waistband pants and a lacy collar to complete the romantic prince look. This ensemble is great for costumers who want a live action Disney look instead of a costume based on the animated movie. Pick up some brown face paint to add to the look and you'll be ready to win the attention of princesses everywhere. If a cat-fight breaks out between some popular Disney princesses because they're battling for your affection, don't blame us because you're one handsome beast!